Now, if there was something wrong with the northeast there would be a good reason for this, but the northeast is actually the nicest part of the country. When Koreans talk about going to the sea for fun they never mean the sea in the west, which is shallow and cold and an industrial centre shared by a number of large Chinese cities as well - they mean the part on the east side (Sea of Japan / East Sea) down to Busan and off to the west until you reach the southwest corner and the islands there, never Incheon and the area nearby. In contrast to this the sea on the east side is the stiller and deeper Pacific Ocean, the sun rises there, and lots of people make road trips to go see it in the morning. Seoul and nearby: super hot in the summer and rainy season just before that, cold in the winter (down to -15 but also very windy), Incheon along the sea is windier. Gwangju: one would think that being located down in the south would make it quite a bit warmer than Seoul but it's less than you would think, only about three degrees warmer there. Busan: the warmest part of the country outside Jeju-do, but quite windy and rainy at times. Jeju-do: like Busan but even more so. Higher temperatures, even more wind and rain. Northeast: temperatures similar to Gwangju, but the Taebaek Mountains just to the west block a lot of the wind and snow and the ocean on the east moderates the temperature. This satellite picture in the winter probably demonstrates this best. 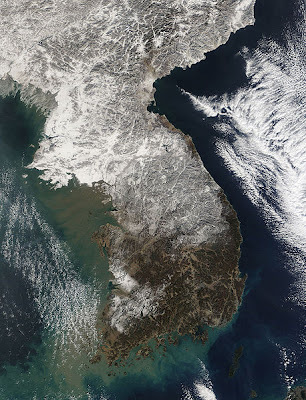 Seoul is snowed in, as area the mountains in the northeast and southwest. Busan in the east is nearly always free of snow as is the ocean to the south, but also note that the area in the east at the same latitude as Seoul is free of snow as well. North Korea is almost entirely snowed in. There actually is a reason why the northeast has remained relatively free of people: a catch-22 type situation where the mountains make it more difficult to set up rail and road links which means fewer people, and with fewer people there's less motivation to set up rail and road links in the first place. Fewer people = less rail, less rail = fewer people. But if the transportation problem were to be solved (KTX is eventually expected to extend there) then there's no reason why it shouldn't become a popular place for more people to live. It's a bit like Vancouver and Seattle in how the areas right by the ocean are quite mild, but just a little ways away you have some of the best mountains in the nearby area with a lot of skiing and other winter sports. 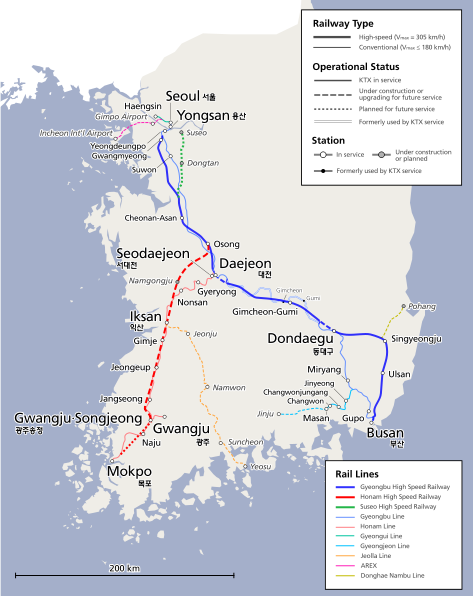 This is one of the reasons why the results of the 2018 Olympics will be particularly interesting as if Pyeongchang finally gets them (their third try and apparently Pyeongchang is the bid to beat) then high-speed rail to the northeast will be given priority and we'll see the region get paid attention to for the first time.